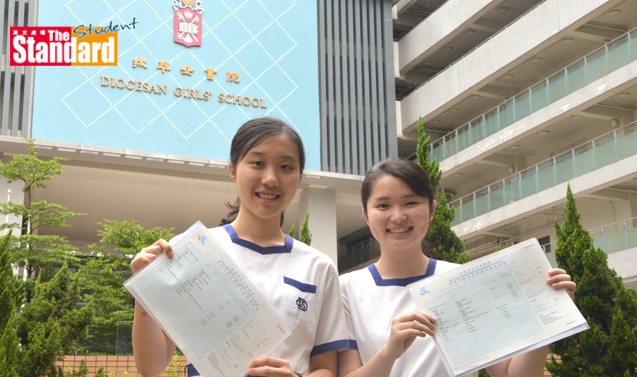 OF this year’s crop of four Diploma of Secondary Education exam (DSE, 中學文憑試) top scorers, three hope to pursue a career in health, while one will take up law. A total of 24,298 candidates met the minimum requirement for university, competing for about 13,000 places at the eight government-funded universities. Wong Ho-sum (黃灝森) from Queen’s College (皇仁書院), who got seven level 5** in his core subjects and electives, said he got good results because he was interested in the subjects. He said he wants to become a doctor because of his personal experience with appendicitis. “A patient can be really helpless and can only rely on doctors,” said Wong, who is hoping to get into the University of Hong Kong (香港大學) medical school. Bernice Cheung Cheuk-sin (張綽倩) from Diocesan Girls’ School (DGS, 拔萃女書院), said she wants to study medicine because she had made a promise to her grandmother as she lay dying. For Tammy Yiu Tsz-ching (姚子晴), also of DGS, bullying motivated her desire to become a dentist. “I saw students being bullied because of their misaligned teeth and jaws, and I believe correcting the abnormality will really improve one’s self-confidence,” she said. Natalie Se Wing-tung (史泳桐), perfect scorer from St Paul’s Co-Ed College (聖保羅男女中學), plans to pursue a double degree in law and business in HKU. “I would really like to join the Legal Aid Department if I have the chance,” she said.